Moussaka is a dish that is very popular in the Balkan region of Europe, and the Near East, but every country has a different way of preparing it. And, every one of those countries will claim that moussaka is their national dish. 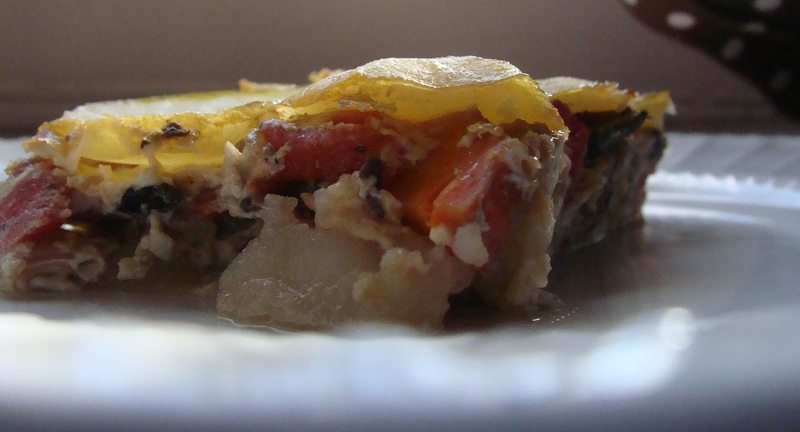 Where I come from, Macedonia, moussaka is filled with a ground beef mixture and it is layered with potatoes. Looking to make a healthier version of it, I opted for a mixture that includes portabella mushrooms, tomatoes, and carrots. This Vegetarian Moussaka with Portabella Mushrooms is absolutely delicious… heavenly when you pair it with a glass of Pinot Noir. Egg substitute equivalent to 3 eggs – I use Ener-G substitute = 4 1/2 teaspoons of Ener-G egg replacer plus 6 tbsp. of water. Boil and peel the potatoes – cut into 1/4 inch slices. 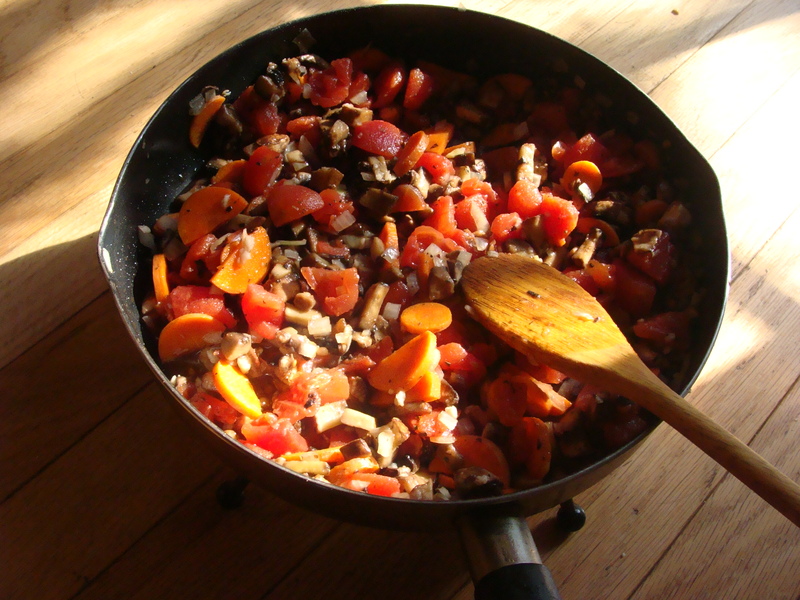 In a non-stick pan throw in the mushrooms, carrots, garlic, onions, tomatoes, cover with EVOO and stir. Set the pan over medium-low heat for 5 minutes. In the meantime, in a deep baking dish, arrange the potato slices one next to another and cover the bottom. Bring over the mushroom filling and throw it over the potatoes, evenly. Cover with another layer of potato slices. In a medium bowl, whisk together the soy milk and the egg substitute. Pour it over the potatoes. Put the baking dish in the oven for 45 minutes to an hour. Allow it to cool for about 10 to 15 minutes before serving. Moussaka with portabello Mushrooms…it can’t get any better than that! Just love it!